We use inlays and onlays made of porcelain or composite resin fabricated by a dental laboratory. These pieces are bonded to the area of the tooth that has been removed due to damage. Inlays, similar to a filling, are used inside the cusp tips of a tooth. 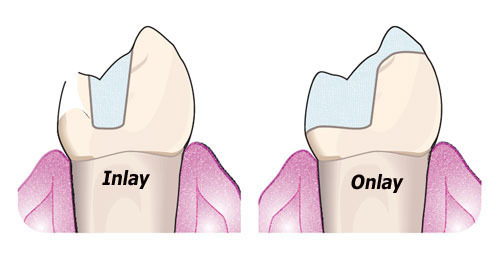 Onlays are a more substantial reconstruction, extending out over one or more of the cusps of a tooth. These restorations usually take two appointments in our Newport Beach office.